In these times of text and picture messaging and email, not to mention video streaming, postcards are not the thrilling “must send home” items that they once were. I still scour the ever-diminishing selection of postcards, but more for the images I wish to add to my collection and less about what I’m sending to friends and family. As a child of the pre-digital camera era, postcards were the way I brought home gorgeous images of my most beloved attractions and characters. In early EPCOT Center, in other words before Mickey showed up in his rainbow emblazoned silver space suit, characters were hard to come by. The mascot duo of Dreanfinder and Figment were the marquee stars of the park, and their presence in the merchandise arena was equally dominant. Looking back at the cartooned postcards found at EPCOT Center in its first few years, Figment garnered a spot on three of the four cards. Who captured enough prominence to filch a single card away from the purple pigment Figment? Why, the cast of Kitchen Kabaret! 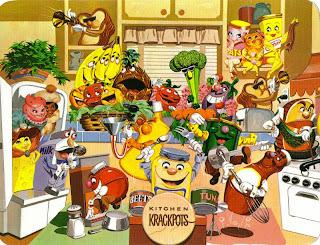 During your tour through The Land, you will see a wacky show called Kitchen Kabaret, which tells the story of nutrition in a very unusual way. This card was released in 1982 when the park opened. The hostess of these musical meal elements, Bonnie Appetite, is not included in the artwork, nor is Mr. Eggz (although part of his shell, hat, and one arm with cane is just barely visible on the right edge), but every other member of the edible ensemble is present. The show presented the message of good nutrition, and how eating balanced meals will help you feel better and have more energy. While they did not get as much facetime around EPCOT Center as Figment, the Cereal Sisters, Hamm and Eggz, Colander Combo and others were an indelible part of the early Epcot experience. Thankfully, they were immortalized in two highly sought after postcards, especially this one where the tunes and characters almost jump right out of the card. ...were an indelible part of the early Epcot experience.